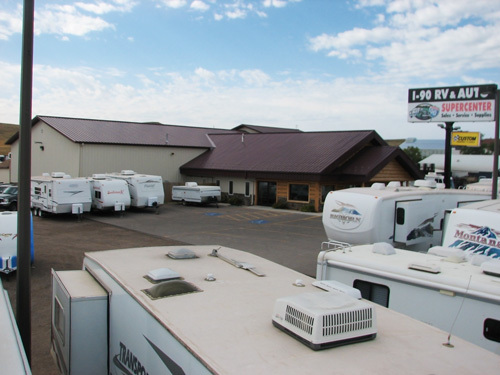 I90 RV & Auto Super Center | Rapid City SD | RV's, Motor Coaches & Used Cars! We offer Peace of Mind Purchasing with some the finest pre-owned vehicles on the market. We have on-the-spot financing with up to 90 day deferred payments and a full service department with ASE certified mechanics. If you have any questions or comments, or would like to find out more, we invite you to contact us. Custom Cabins built with your needs and budget in mind!! We will work together with you to have the best ending result to suit your needs. Call us today to get your cabin started and start enjoying your own cabin in the hills, on the lake or just simply to get away from it all. We can build these big enough to also become your 1st or 2nd home. Thank you for all your help with motorhome purchase. The process was a lot longer than we anticipated. Your patience is very much appreciated. You are all the best to deal with. We will highly recommend I90 to everyone we know. In early June of this year my wife and I left for a summer stay in beautiful Montana, After serveral days on the road,w e stopped in Rapid City, SD for an overnight stay. Low and behold, we went to the refrigerator only to find it was not working, leaving us in a dire situation. Only as luck would have have it, we happened to look accross the road and saw a repari shop by the name of I-90 RV & Auto Super Center. So off to the repair shop we went. What a pleasant suprise, they immediately took us in and diagnosed the problem after extensive testing and work. The old refrigerator was shot. These people went over backwards to help us, the owner was right there checking on us every moment. Two days later the new refrigerator arrived and was very professionally installed and 2 hours later was operational. My wife and I would highly recommend that in the event of an unforeseen problem with anything mechanical or with your RV unit while in the area Rapid City, SD that you stop in and see them. This breakdown could have been very stressful, but due to the professionalism of this business and its employees, this was close to a stress free event as you could ever hoped for. Leroy and all the other I90 RV and Auto shop guys have helped me over the past 2 years. please accept this gift certificate for all the time you've spent on the phone with me troubleshoting RV problems. You are my Heros!